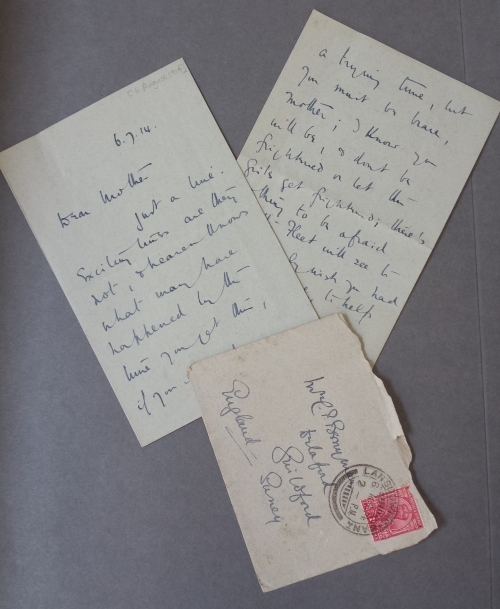 The wartime letters of Ted Berryman OKS will appear on-line on the centenary of their original date. They can be viewed at: Family Letters. Edward Rolleston Palmer Berryman (1883-1964) was at the King’s School from 1898 to 1902. A King’s Scholar, he was a monitor and played in the rugby 1st XV. He then went to Sandhurst and became an officer in the Royal Garhwal Rifles. During the First World War he wrote some 400 letters home. He was in India at the start of the war, and then served on the Western Front (1914-15), as well as in Egypt and Mesopotamia. He was awarded the DSO (‘for most conspicuous gallantry and devotion to duty’) in 1919. His brother Christopher (‘Topher’) was also at King’s, from 1904 to 1910. He too served in the Great War.